Recent research highlighting how important sleep is to our overall wellbeing has left many people wondering about their own sleep patterns. Unless you have symptoms that align to a sleep disorder, it may be difficult to get a referral for testing at a sleep center. If you are curious about sleep tracking and knowing how much sleep you are getting, or wondering if a secret sleep disorder could be the source of some nagging problems, there are products available that offer a view into your sleep habits from the comfort of home. These sleep tracking products can provide you with a starting point to understanding how you sleep, but they are not a replacement for comprehensive sleep center testing and treatment by a doctor. They can, however, help you learn more about yourself and open the door to a conversation about sleep with your doctor. Determining which sleep tracking product might be right for you will depend on what concerns you have about your sleep. The products offered by Zeo provide a fairly comprehensive picture of your sleep patterns. If you are concerned about sleep apnea or sleep disordered breathing, Shut Eye’s screening program might be a better fit. The concept behind Zeo is that is measures your individual sleep patterns each night including how long you spent in each sleep phase, how long it took you to fall asleep, and how many times you woke up over the course of the night. It also allows you to input lifestyle information like caffeine intake and exercise that become part of your overall sleep analysis. This sleep tracking device allows you to identify patterns over time and see the impact corrective action has on your sleep pattern. 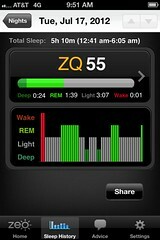 Zeo offers two models that collect the necessary data, My Sleep Coach and Zeo Mobile. My Sleep Coach is a bedside system that captures data and stores it to a memory card so that it can be uploaded to your computer and imported into the tracking and analysis tool. Zeo Mobile offers all the functionality of the Sleep Coach model but provides better mobility and is easier to use. The primary difference between the two products is that Zeo Mobile connects directly to the Zeo app on your smartphone via a Bluetooth connection which removes the need for you to upload your data. The set-up is also more portable which makes it ideal for someone who travels. Zeo also offers SmartAwake as part of both models. This function replaces your normal alarm clock and uses your sleep patterns to determine the most optimal time to wake you up within the 30 minute window before the alarm is set to go off. This can make waking up easier and give you a better start to the day. The SleepTracker Elite watch measures and logs your sleep patterns while you are asleep enabling you to download the information onto your home computer. SleepTracker provides continuous monitoring throughout the night and uses signals from your body to determine if you are awake or asleep. Because you wear SLEEPTRACKER® on your wrist like a watch, its internal sensors can detect even the most subtle physical signals from your body. It only tracks whether you are asleep, awake, or almost awake and doesn’t provide information about sleep phase. SleepTracker can also be used to wake you up during an almost-awake moment that falls within your designated wake-up window. This helps ensure you will be alert and energetic when you get out of bed. The Shut Eye Sleep Screening program provides customers with a way to screen for sleep disordered breathing and other breathing disorders exhibited during sleep from home. The benefit to customers is that they can undergo this initial screening without having to spend the night in a sleep center. Data is collected by a pulse oximeter worn on the wrist that connects to a sensor worn on the finger. Customers sleep while attached to the equipment for a certain number of nights and then send the equipment back to O2Connection. The company compiles and analyzes the customer’s sleep data and provides a detailed report of the findings. The Shut Eye Sleep Screening program offers a variety of reports, which is what the customer is actually purchasing. Sleep disordered breathing screening can be done over 3 nights or 7 nights. A more generic sleep report is also available for either 3 nights or 7 nights. The reports provide information about oxygen saturation levels over the course of the night but do not offer any additional information about sleep phase or duration.